Carphone Warehouse announced its decision on Monday. 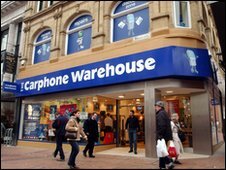 Mobile phone retailers Carphone Warehouse and Phones 4U have temporarily withdrawn the Sony Ericsson Satio smartphone from their stores. Both companies said the move followed complaints from customers about software problems. Phones 4U announced its decision to stop selling the handset 24 hours after rival retailer Carphone Warehouse. Sony Ericsson said it was "giving this matter its utmost priority and working toward solving it". None of the companies involved gave details about the nature of the fault but Satio users online have been complaining about frozen screens and problems with ringtones. "Now on my second Satio and it still has the same issues," wrote Iain H on a handset review site. "Screen freezing and no ringtone. Only way to solve the problem is to take the battery out." He added: "I'm glad I'm not the only one with this problem." Sony Ericsson recently announced a new smartphone model, the Xperia X10. It is the company's first Android handset but it is not due to go on sale until 2010. Verity Burns, a technology journalist with gadget magazine Stuff thinks the problem lies with how the Sony Ericsson user interface interacts with the Symbian operating system on the phone. "The phone seems to be turning itself off when people access certain applications but not everyone will be affected. Vodafone and Orange run their own interfaces and don't seem to have the issue."